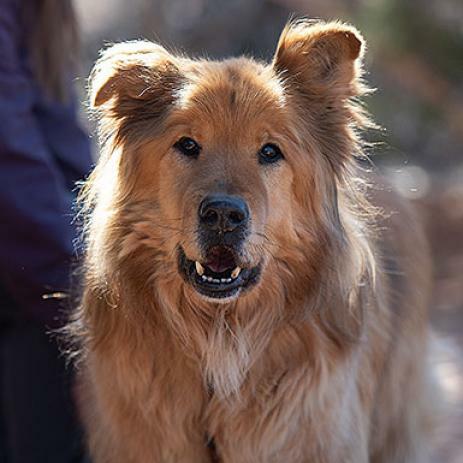 Rescued from a property during a dog fight bust in Colorado, Jacko came to Best Friends from a humane society. At Dogtown he is affectionately called 'Jack Jack.' He adores his toys and treats them like his babies, carrying them around and sleeping with them on his bed. Because he loves his toys so much, he will guard them from other dogs and from people. He will guard his food and food bowl as well. Dogtown trainers and caregivers are currently working on trading him treats for his bowl, and they give him space when he is eating. Jacko is playful with new dogs once he has gotten to know them, but he also enjoys sunbathing outside with his roommate at Dogtown. Because of his past, Jacko can be nervous meeting new people, especially if he is meeting them for the first time in a small space. He is more confident meeting people outside in an open space and during a walk. Since walks, treats and toys are some of his favorite things, he will trust new people more quickly if they offer him one of these things. He does take treats nicely, and he is eager to learn new things when treats are the reward. Once he is friends with you, Jacko will run right up to you and stop directly in front of your feet to ask for pets and scratches. He can be a very quiet dog and does not 'talk' very much, unless other dogs are 'talking,' too. At the Sanctuary, he is also doing muzzle training, loose leash walking, and is learning basic training cues. Born in 2011, Jacko has age-related degenerative conditions in his joints and spine. He has started taking some supplements to help with this, but he will need to be monitored for pain, as it will likely become worse with age. He is usually a slow walker, but he loves to run when he feels up to it. Recently, Jacko learned to use a ramp to get into a car. He loves lying down and relaxing in the car and is an excellent passenger. Jacko needs a person or family who will show him that it's OK to trust new people. He'll need extra time to meet new people, especially visitors to a home. When he is comfortable, Jacko is truly a clown. He will play bow at people and flash his adorable smile.